This book is meant to cover Java persistence, that is, storing stuff in the Java programming language to a persistent storage medium. 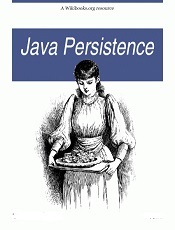 Specifically using the Java Persistence API (JPA) to store Java objects to relational databases, but I would like it to have a somewhat wider scope than just JPA and concentrate more on general persistence patterns and use cases, after all JPA is just the newest of many failed Java persistence standards, this book should be able to evolve beyond JPA when it is replaced by the next persistence standard. I do not want this to be just a regurgitation of the JPA Spec, nor a User Manual to using one of the JPA products, but more focused on real-world use cases of users and applications trying to make use of JPA (or other Java persistence solution) and the patterns they evolved and pitfalls they made. This book is intended to be useful for or to anyone learning to, or developing Java applications that require persisting data to a database. It is mainly intended for Java developers intending to persist Java objects through the Java Persistence API (JPA) standard to a relational database. Please don't just read this book, if you're learning or developing with JPA please contribute your experiences to this book. JPA is a new Java persistence standard based on object-relational mapping and utilizing object-oriented features of Java. It is expected to gradually replace JDBC and proprietary object-relational mapping frameworks/libraries for most Java applications with database access. JPA makes software development fun and leads to improved productivity.